Is there a sufficient air supply? Is there a sufficient material supply? Is the air regulator set at desired pressure? Disconnect outlet hose, turn air pressure down and trigger the applicator: If it cycles and pumps material, the hose or applicator is plugged. If not, remove the outlet check valve. Trigger the pump, checking for movement of pump; if no movement, check for plugged pump or air motor problem. If the pump doesn’t run but pressure from drive cylinder can be felt, the problem is in the lower section. The fluid pump can be replaced or rebuilt with repair kit. Problem in hose or gun. Problem is in the hose if it’s plugged or kinked and should be replaced. Problems is in the gun if it’s plugged. The gun can be disassembled and cleaned. Check level of material in containers, making sure level is always over 1/3 filled for immersed units. Clean off applicator dispense head. 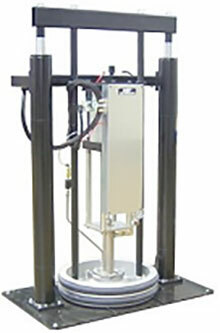 Trigger applicator into waste container to verify smooth, air-free material flow. Trigger the applicator to remove any pressure in lines or system. Clean and cover the head of applicator. Check air supply for clean air. Check tightness of luber on outlet of pump connecting rod. Apply a compatible lubricant to zerks on luber.